Where to eat in Portland? Check out the best off-the-beaten-path foodie spots on this scenic 3.5 hour bike tour of NE and N. Portland, the epicenter of Portland’s creative and culinary culture! 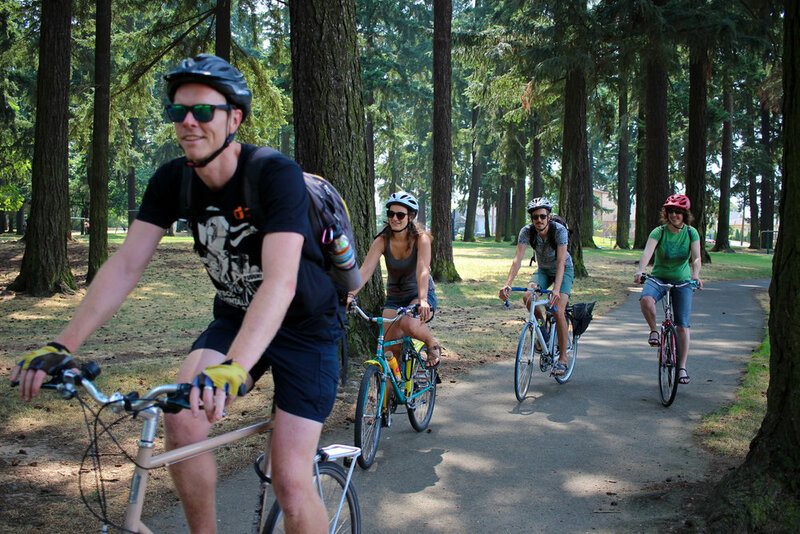 On neighborhood greenways and bike lanes, we'll explore the history, flavors, sights, eccentricities, and unique culture of N & NE Portland's Alberta, Woodlawn, Mississippi, & Sabin neighborhoods, our favorite part of the bike-friendliest town in America! Incredible small-batch PASTRIES at SEASTAR BAKERY! Freshly handmade ICE CREAM SANDWICHES at RUBY JEWEL, the original artisan ice cream of Portland. RAINBOW OF BEER FLAVORS at HOPWORKS BIKE BAR (tuesday only)! Portland CULTURAL and HISTORIC sites. A few surprises and secrets along the way! PRICE INCLUDES: 24hr bike rental, food, drink, and fun+knowledgeable tour guide. Participants must be 13+, comfortable riding a bike, able to ride 9 miles, and feel comfortable riding on a safe route with occasional car presence. Should I eat immediately before this tour? Unless you have a track meet later today, it’s probably best to come unfed. I’m vegan/vegetarian/pescatarian. Is this tour for me? Yes! We can accommodate your dietary needs for the most part. Feel free to call us if you have questions.